Making learning science a fun experiment! Find a complete listing of items for a full-line science curriculum. Nasco Science catalog carries items for general science, biology, chemistry, physical science, earth science, life science, environmental science, and technology education. Special emphasis is placed on hands-on science investigations, science kits, and safety in the classroom. Earth Science Activities for Kids - Earth science activities for kids from Nasco, teaches them what makes the world go round! Kids will go from the earth to the moon over science kits and activities that will let them explore the entire planet, while learning about volcanoes, earthquakes, tsunamis, and other natural disasters. Science Activities for Children - Find elementary science activities, elementary science experiments, and a full range of hands on kits and games. These cool science projects will help kids at all levels get hands on with science and will quickly boost science to the number one slot on their list of favorite subjects. Science Games for Kids - Rely on Nasco for a collection of science games for kids that'll keep your mad scientists entertained and learning for hours. With Nasco Bingo, Reptile Clever Catchball, and Classroom Jeopardy on deck, they'll never want to be dismissed! Live Materials and Dissection Supplies - Keep your science classroom well stocked with the necessary tools to make dissection of animals, small and large, easy, as well as living specimens to create an amazing science experience. Nasco provides a wide selection of dissection items from instruments like scalpels and trays to preserved specimens, such as earthworms, frogs, fetal pigs, and cats. Nasco also offers alternatives to dissection (such as DVDs, videos, and CD-ROMS) for those who choose a dissection-free curriculum. Nasco carries live materials to enhance the learning experience. You can find frogs (Xenopus laevis), protozoan for the research under the microscope, reptiles, fungi, plants, fish, and more. Lab Supplies - With a full range of chemistry lab supplies, your lab will never be short a beaker. Choose from microscopes, incubators, unbreakable flasks, hot plates, Bunsen burners, and all the other instruments you need to ensure your classroom chemistry is ignited. Free Lesson Plans - Enjoy free science lesson plans that are easy to download for personal use. Whether you need middle school science lesson plans, earth science lesson plans, or elementary science lesson plans, Nasco offers Animal Track Adventures, Current Electricity, and other fun experiments and activities. 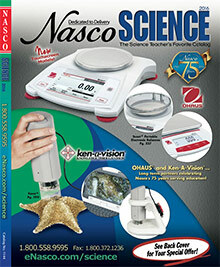 Nasco Science provides the perfect formula when it comes to science activities for children and resources for teachers. Consider Nasco your trusted lab partner for a comprehensive collection of free science lesson plans, children science books, science kits for kids, and more. You'll have everything you need for a full year of science curriculum.